Modern analysis of forgotten samples has given chemists in the US additional insights the origins of life on Earth. Stanley Miller became famous with a single experiment carried out during his PhD thesis with Harold Urey. 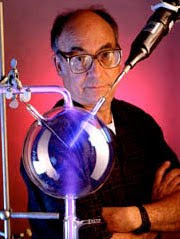 The experiment simulated conditions in a sealed apparatus, which according to Urey's previous work were believed to have predominated on the primeval Earth, including an ocean, a reducing atmosphere, and a spark discharge meant to simulate lightning. After only a few days, this experiment produced a rich mixture of organic molecules including some of the amino acids found in proteins today. Over the next half-century, Miller continued to study prebiotic chemistry and possible origins of life in many variations but he never reached a definitive explanation of the origin of life. Following Miller's death in May 2007, his former student Jeffrey Bada, a geochemist at the University of California at San Diego, inherited the contents of Miller's lab and office and discovered samples from 1958. The samples were clearly labelled and referenced in Miller's lab notebook but never reported. Bada's group has now analysed these samples using modern HPLC and mass spectrometry to gain two independent descriptions of their chemical composition. The unreported (until now) 1958 experiment again involved a spark but the gas mixture included both reduced and oxidised substances and was the first experiment to contain hydrogen sulphide (H2S). Bada's team found that the unreported samples contained a greater abundance and variety of biologically relevant molecules than Miller had reported in his 1950s studies. The samples also contained oxidation products of the sulfur-containing amino acids cysteine and methionine, which Miller didn't report making until the 1970s. While a gas mixture like the one Miller used in 1958 may not be representative of the Earth's early atmosphere overall, Bada and coworkers believe that it may well mimic the complex chemical conditions near volcanic sites.